Sailing into Chatham bay was amazing. Surfing down the waves, the dolphins glide swiftly through. 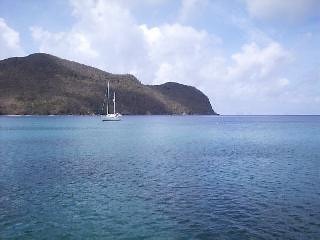 We anchored and had a peaceful nights sleep. We awoke with the sound of sea birds welcoming the sun to a new day. Something grey swims past a neighbouring boat, off we go with our snorkeling gear. 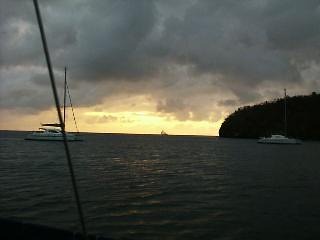 We bailed over the side of the boat and to our great amazement, we found ourselves swimming with a Manta Ray. Holding onto it, gliding under the water, lean to the left and the manta will swim in that direction. Gliding through the water holding onto the Manta is like flying with ease. Swimming back to the boat, a baby Leatherback Turtle glides by, we follow it down between the coral, and then like a flash it disappears into the darkness below. 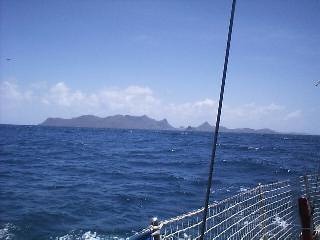 Approaching Union Island from Carriacou. 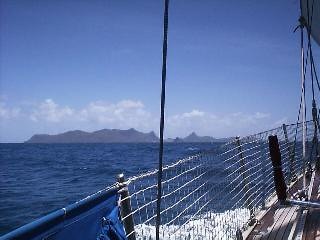 It belongs to the Country of St. Vincent and the Grenadines. Clifton Harbour is just visible to the right. 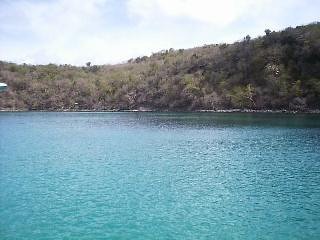 We spent a few nights in Chatham Bay, The fishing was superb, and it was a sheltered waiting place for the wind to drop a bit, before we went to the Tobago Cays. 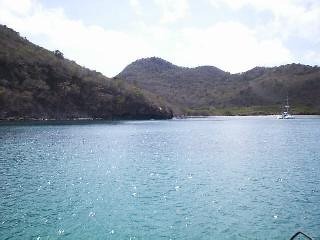 This is where Laura and Liz swam with a Manta ray.